March 10, 2015: With the Federal Transit Administration’s (FTA) issuance of a Finding of No Significant Impact (FONSI), the OC Streetcar is now environmentally cleared and ready to advance for additional design and engineering. May 5, 2015: OCTA receives approval to enter Federal New Starts Program. February 9, 2016: OC Streetcar got a major boost when President Barack Obama included $125 million for the OC Streetcar in his budget for next fiscal year, signaling federal endorsement for the much-anticipated project. The project development phase includes the development, public circulation and approval of all environmental documents, the adoption of the preferred route by the cities, and the beginning of project design. In the design and engineering phase, all the details of how the streetcar will be constructed and operated will be developed. In the construction phase, tracks will be laid and the streetcar will become a reality. 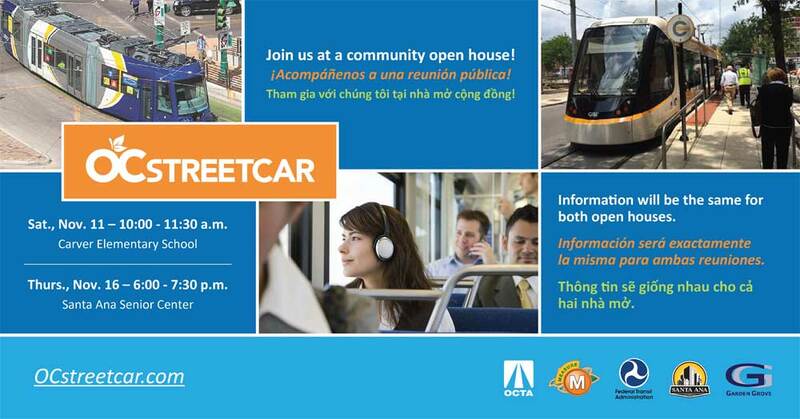 Since safety is a top priority, the streetcar system will be thoroughly tested before it is ready for public use. The preliminary cost estimate for the OC Streetcar is $408 million (year of expenditure). This OC Go project, is being constructed in cooperation with Caltrans and will be funded mostly through a combination of local, state and federal funds. Thank you for visiting the OC Streetcar webpage. To improve your next visit, please complete this brief survey. September 2018: Construction contract awarded to Walsh Construction Co.
To complement Orange County’s Metrolink service, passengers need a way to get to their final destination after getting off a train. Through Transit Extensions to Metrolink, a Measure M program (now called OC Go) intended to broaden the reach of Orange County’s backbone rail system to key employment, population, and activity centers, the cities of Santa Ana and Garden Grove developed a fixed guideway project that would address this need. After evaluating many alternatives and extensive outreach, a streetcar was chosen as the preferred alternative. Expected to begin operations in 2022, the OC Streetcar will link the bustling Santa Ana Regional Transportation Center (SARTC), which provides regional rail, OCTA bus, and intercity and international bus services, to a new multimodal hub at Harbor Boulevard/Westminster Avenue in Garden Grove. Along the way, OC Streetcar will connect directly with 18 OCTA bus routes. OC Streetcar will serve the historic downtown Santa Ana and Civic Center which includes government offices, federal, state and local courthouses, unique restaurants and shops, an artists’ village, several schools and a variety of community enrichment organizations. A streetcar is a short train-like vehicle with metal wheels powered by electricity that operates alongside cars via rails embedded in the street, providing circulation within local neighborhoods. Light rail system vehicles are longer, travel faster and typically operate within a lane separate from streets, providing transportation between cities and/or suburban areas. What does a streetcar do? Streetcars provide local circulation in urban areas and share their right-of-way with automobiles, traveling with the flow of traffic. How do streetcars operate safely on local streets? Modern streetcars move with the flow of traffic and allow passenger pick up and drop off at designated stops. Public outreach and pedestrian safety education programs will be offered to familiarize local residents and business owners with the new system. How many people can a streetcar accommodate? Streetcar passenger vehicles can typically accommodate up to 150 passengers. How fast does a streetcar travel? Streetcar passenger vehicles can typically travel up to approximately 35 miles per hour. While the speed of the OC Streetcar will vary depending upon the speed of traffic, the average speed will be approximately 11 mph. Streetcars are typically powered by an overhead power supply. How long will the OC Streetcar route be? The route will be 4.15 miles in each direction. How many stations will there be? There will be 10 stations. How often will the streetcars run? The streetcar will run every 10 to 15 minutes during operating hours. How can I use my bicycle on the streetcar? Bicycles will be allowed on the streetcar, either on bicycle racks or in designated areas inside the vehicles. Public outreach and bicycle safety education programs will be offered to familiarize bicyclists with the new system. How much will it cost to ride the streetcar? Streetcar fares will be similar to OCTA bus fares. Will individuals with physical disabilities be able to ride the streetcar? Yes, the OC Streetcar will be ADA compliant. Did the cities of Santa Ana and Garden Grove select this particular route? As part of OCGO, formally Measure M, all 34 cities in Orange County were given the opportunity to develop transit extensions to the Metrolink corridor. The cities of Santa Ana and Garden Grove competed for and were awarded funds, through Measure M - Transit Extensions to Metrolink, for further development of a fixed guideway project that would broaden the reach of Metrolink to key destinations within their communities. The route was chosen by the Cities of Santa Ana and Garden Grove as a result of a detailed alternatives analysis (AA) study that evaluated multiple routes and technologies. The locally preferred alternative (LPA), Streetcar Alternative 1, was selected by the Santa Ana City Council on August 5, 2014 and adopted on January 20, 2015. The City of Garden Grove also adopted a resolution approving the LPA on February 10, 2015. What does the alternatives analysis (AA) evaluation process include? The AA includes (1) Preliminary Definition of Alternatives, (2) Initial Screening (Route Options), (3) Initial Screening (Technology Options), (4) Detailed Evaluation and Environmental Impact Analysis, and (5) Locally Preferred Alternative. Was the community involved in the alternatives analysis (AA) evaluation process? Significant public outreach was conducted at each phase of the study. When was the alternatives analysis (AA) evaluation completed? The AA was completed in April 2014. How much will the OC Streetcar Project cost? The estimated Capital cost is $298 million (year of expenditure). Will businesses be closed during construction? No, access to businesses will be maintained during business operating hours and signage would be posted alerting nearby businesses of temporary closures and/or detours. Parking will be impacted; however, residential and business properties will maintain an on-site parking capacity that is consistent with local zoning and occupancy entitlements. During construction lane closures will be required; however, every effort will be made to minimize these concerns. Signs will also be posted to alert nearby residents and businesses of temporary lane reductions, weekend or nighttime closures, and/or detours. Have a representative of the OC Streetcar speak to my organization.